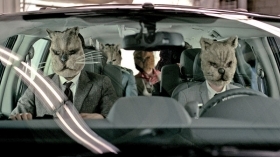 In a stark departure from the soccer-mom era, Dodge's "Kittens" commercial shows a vanful of operatives, in cat masks, on a murkily defined mission. DETROIT -- Once upon a time, minivan commercials showed moms hauling kids to and fro. But the latest Dodge Grand Caravan spots throw those cliches overboard in favor of claustrophobic spoofs of spy movies. The edgy new commercials are part of Dodge's campaign to reposition itself as a youthful, sporty brand following Chrysler CEO Sergio Marchionne's decision to separate the brand from the Ram truck brand. The TV spots were created by Dodge's new agency, Wieden+ Kennedy, the Portland, Ore., agency best known for Nike commercials. View the Grand Caravan commercials at autonews.com/caravanads. The spots, which have a spy-movie ambience, show Grand Caravans filled with anxious grown-ups carrying out unspecified but risky activities to suspenseful music. The missions require the characters to watch Sirius Backseat TV and use their laptops, connected to the Internet via the Grand Caravan's mobile hot spot. In one commercial, called "Kittens," the minivan pulls into an alley. As the Grand Caravan comes to a stop, the female driver commands her male passengers: "All right, kittens, suit up." They don cat masks, climb out and purposefully stride off clutching briefcases. The voice of TV actor Michael C. Hall intones: "It has everything, so you can do anything." Ralph Gilles, CEO of the Dodge brand, says: "We're trying to position the van in a very different way. This is kind of an experiment. We're pushing and pulling the audience. It's obviously polarizing." Dodge first used Hall's world-weary voice in the Super Bowl commercial for the Charger sedan called "Man's Last Stand," a controversial spot that generated a parody called "Woman's Last Stand." Gordon Wangers, an independent marketing consultant in Henderson, Nev., likes Wieden+Kennedy's work for Dodge and loved the Super Bowl commercial: "I was mesmerized. I thought it was one of the greatest ads in the history of the business." Peter DeLorenzo, a former Detroit advertising executive who now authors a Web site called autoextremist.com, praised the Super Bowl commercial. But he dislikes the Grand Caravan spots, describing them as "horrifically bad." Wangers says it's OK to be polarizing, as long as you have a message. Gilles says the Grand Caravan commercials are designed to make people think about the minivan in a new way: "It's Swiss Army Knife. It's not just about carrying kids."